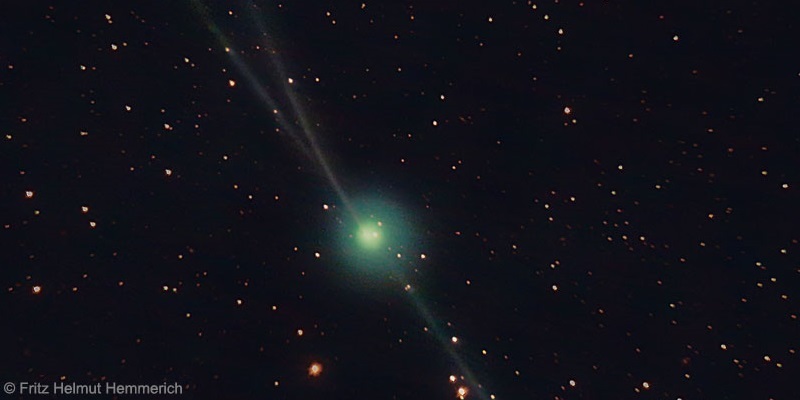 Faithful Comet Encke is one of the shortest-period comets known. Its frequent returns near the sun helped reveal the true nature of comets. Comet Encke appears to have three tails in this image. One tail is the comet’s dust tail. As the image was taken, the comet’s gas or ion tail was split by the turbulent solar wind. Photo by Fritz Helmut Hemmerich/ APOD (February 20, 2017). Comet Encke, known for its short orbital period of 3.3 years, is at its closest point to the sun today (March 10, 2017). 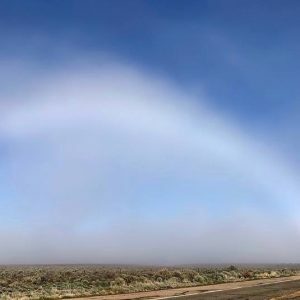 This point called its perihelion, with the word stemming from the Greek words peri, meaning near, and Helios in honor of the Greek god of the sun. 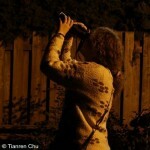 Is the comet visible in our sky now? No. It was visible in February and possibly until early March, whipping around the Circlet asterism in the constellation Pisces, in the west shortly after sunset. Now, however, Comet Encke has plunged southwawrd and become lost in the glare of evening twilight. Comet Encke visits us often and is now on its 63rd known visit to our part of space, with uncounted visits before those 63. And thus it’s a well-studied comet and an interesting comet, for many reasons. Encke is considered a short-period comet, and its orbit is much shorter than – for example – the brighter and more famous Comet Halley, known for its appearances to the unaided eye in Earth’s sky. Halley’s orbital period is about 75-76 years, and it last appeared in Earth’s sky in 1986 and will next return in 2061. Is Encke the shortest-period comet known? Not exactly, although it’s the shortest-period comet that becomes visible to observers using modest telescopes or binoculars. The exceedingly faint main-belt Comet 311P/PANSTARRS, for example, has a slightly shorter period of 3.2 years. Comet Encke has a fascinating history. As its official designation implies, 2P/Encke was the second comet recognized as periodic, after 1P/Halley. Prior to the time of those recognitions, comets will little understood objects – considered bad omens by the early skywatchers – thought to appear only once, ever, in our sky. It was Pierre Méchain‘s 1786 observation of Comet Encke that was the first one to be noticed by science. That is because Johann Franz Encke later used Méchain’s observation as the first observation in a series, in which he was able – through laborious calculations – to link observations of comets in 1786 (designated 2P/1786 B1), 1795 (designated 2P/1795 V1), 1805 (designed 2P/1805 U1) and 1818 (designed 2P/1818 W1), showing that all of these differently designated objects were in fact one comet. In 1819, Encke published his conclusions in the early journal Correspondance Astronomique, correctly predicting the comet’s return in 1822. The recovery of Encke’s Comet by Carl Ludwig Christian Rümker on June 2, 1822 was another great victory for the ability of the scientific method to make testable predictions. We say “another” victory because Comet Halley had been the very first comet ever predicted to return, and subsequently recovered on time, in 1758. Hence, 1P/Halley and 2P/Encke. Notice that the pace of scientific discovery was much slower then! Read more about Comet Encke’s history here. Comet Encke’s very short orbit. Notice the comet doesn’t go past Jupiter. Diagram via Orbit Viewer from NASA/JPL Small Body Database. This video, captured by NASA’s STEREO mission, shows the motion of Comet Encke and its tail as it approached the sun in April 2007. At that return, scientists studied the movements of hundreds of dense chunks of glowing ionized gas within the comet’s tail, finding evidence of turbulence that helped explain both the solar wind’s variability and its unexpectedly high temperatures. Read more about this image from NASA/ STEREO. 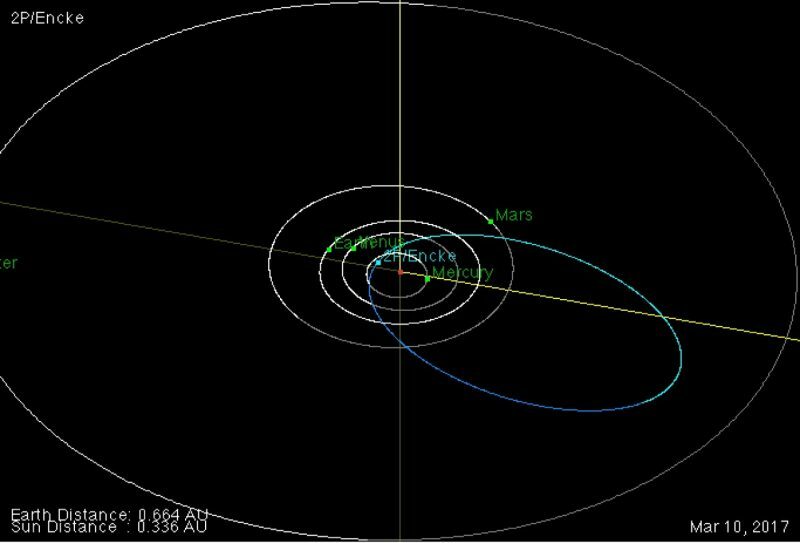 In addition to calculating Comet Encke’s orbital period of 3.3 years, Encke also calculated that the comet’s orbit decays by 2.5 hours at each return near the sun. The reason for the decay remained a mystery until Fred Whipple – who was also the first to describe comets as dirty snowballs – explained it in 1950. Whipple said Comet Encke’s orbit becomes continually shorter because matter boils off its surface, producing a jet-like force that reduced the motion of the comet. More recently, other theories have been proposed as to why a comet’s orbit might decay. The Yarkovsky effect, although usually applied to asteroids, can offer another viewpoint. Comets receive light from the sun. Some of it they absorb and some of it they reflect back. This emitted light is usually infrared. The Yarkovsky effect proposes that the heated photons from this emission generate a force on that comet since they have momentum. Simply put, the Yarkovsky effect is nothing but another case of Newton’s 3rd law. Hot photons hit the surface of the comet and the “comet pushes back” as they bounce off it. You can see this meteor is radiating from the constellation Taurus the Bull. See that V-shaped pattern to the right of Orion? The three Belt stars of Orion point to it. That’s the Bull’s Face. 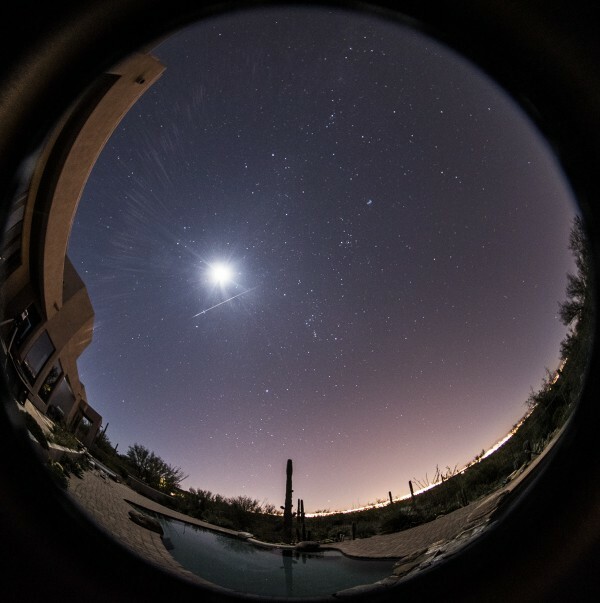 Eliot Herman in Tucson caught this Taurid fireball on November 1, 2015. It’s a remnant of Comet Encke. The bright object that night was the moon. By the way, Comet Encke spawns a meteor shower – a long-lasting one in which many very bright meteors, or “fireballs” can be seen – known as the Taurids. The South and North Taurids appear in late October and November each year and occur as Earth passes through debris in space left behind by Comet Encke. Read more about the Taurids here. Bottom line: Comet Encke, known for its short orbital period of 3.3 years, sweeps closest to the sun on March 10, 2017. The comet is now on its 63rd known visit to our part of space.